Gardening gloves… Almost as personal as pruners. 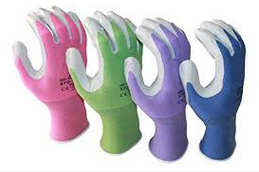 But the more manufacturers pump out new colors (lime green to black), new materials (soft and fuzzy “hand girdles”) and new gimmicks (smart phone and claw fingers for example) the more I appreciate good, long lasting normal gardening gloves. Gardening gloves should be functional and washable and fit the climate. For my money, there are 4 gardening gloves that serve all of these purposes. The very best lightweight summer gloves are Nitrile Gloves and Atlas Super Grips. Nitrile Gloves are meant to fit tight, like a rubber glove. They hug the wrist so soil doesn’t creep in. You can pick up a seed with these and you don’t need some special smart phone “finger” on more expensive gloves in case your phone rings…Nitrile gloves work just fine with a smart phone. I love these for weeding because you can surgically grab the unwanted…I like these for potting up containers and weeding out things like shotweed, chickweed and other shallow rooted weeds. If you slather on some decent hand cream before you put them on you’ll avoid the embedded dirt that comes with wild and crazy weeding. Washable and dryable. Atlas Super Grips are also lightweight but they are better for major weeding and planting. They offer more protection from slugs, stickers and evidently concrete and fish slime. You’ll see them used on construction sites and fishing boats so you know they’re tough enough for gardeners too. I use them when digging and grabbing. Good for spring and summer gardening. Washable and dryable. The Orange Atlas Gloves are the absolute best for wet weather. They have a soft warm lining so I usually use them when it’s either cold or muddy or both. They have a good grip on tools and a They are very flexible so they’re comfortable. They are oil and chemical resistant so you’ll see these being used for far more than gardening. The longer wrist cover makes them excellent for spreading fertilizer or spraying. I wouldn’t wear any other gloves if I was working around wet stuff. Washable and dryable. The jobs that beg for a special pair of gardening gloves are rose pruning and thorny berry picking. You can add pulling out blackberries to that. You want something that thorns cannot penetrate and you want a protective glove that fits like a gauntlet, a Mud Rose Gauntlet. This is the one time that leather is ideal. These are the spendy ones. Goatskin is the preferred material for dexterity and puncture resistance. Your arms will thank you. These don’t wash and dry…you just take good care of them. Avoid the knock-offs for all of these…not worth it.